Come back soon, as this is a work in progress. I try so many different places that when someone asks me what my favorite is, I always have to stop and think. This page is my journal of my favorite places that I have been to. Luckily for you, you can view it and see what I think is the best of the best of Portland. Kenny and Zukes – It’s a favorite because of their corned beef eggs benedicts. Crazy good. I need to go back. Word of Mouth in Salem will always be my breakfast of choice if I have time to drive that far. Jamison does a great brunch. Dinner is rather expensive, but brunch is more affordable and you get to experience their great cuisine. Olympic Provisions –They do all their own meats, so everything is fabulous. Toast – I seriously need to go back, so good. Think grilled muffins and french toast stacks. Veritable Quandary is a great place for a summer brunch. Love the outdoor patio. BumbleKiss – It’s been awhile, but this is the sweetest, cutest place and great food. Interuban – Not only do they have some of my favorite Eggs Benedicts in town, but it’s affordable too. Lardo – These are some great sandwiches and sandwiches are not just for lunch anymore. Plus tons of beer on tap. Jade Teahouse – I love this place. I would drop in all the time if it were closer. Order the glass noodles. Por Que No? – Some people say it’s over rated, I say I don’t get there often enough. Teote – This Food cart gone brick and mortar is a huge hit. P’s & Q’s Market – Best Vegetarian sandwich I have ever had and you know how I love my meat. Didn’t even miss it. Meat Cheese Bread – Not your typical sandwich shop. Don’t miss the Green Bean Sandwich with bacon jam. The Farm Cafe – I am pretty sure I love this more than my husband. iorio – This place is so cute and romantic. Amazing food with beautiful presentation. Lucca – I want to go back for the antipasti platter alone. Oven & Shaker – Who doesn’t love a good creative pizza? The Firehouse – Wood fired pizza and pasta inside of an old converted firehouse. Amazing food. Old Salt Marketplace – Love the chefs choice dining option. Cocotte – Charming small space with large vintage windows that open in the summer, exceptional food. Bollywood Theater – Indian Street food and it’s fabulous. Chicken and Guns – It’s simple here. Chicken and potatoes with a Latin Flair. Excellent!! 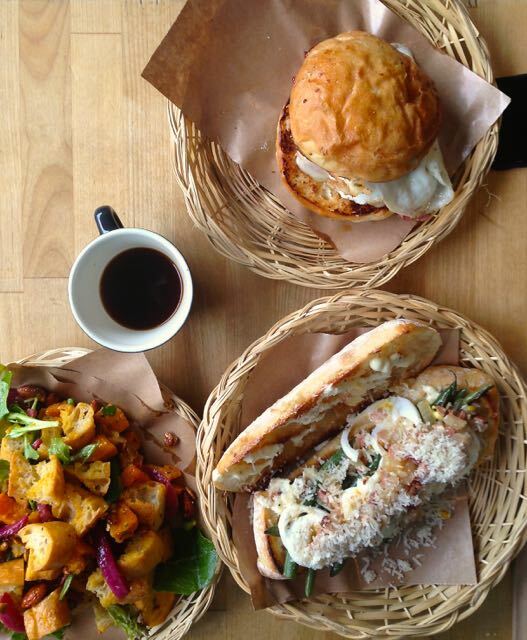 The Egg Carton – Think perfect eggs bennies and super creative breakfast sandwiches. Fishbox – Some of the best Ahi Tuna tacos in town. Gabagool – Cart made pasta that is better than some restaurants. Yep, I said it out loud. It’s better. Verde Cocina – I loved that they had solid food for happy hour not just snacks. The Farm Cafe – They have a great Happy Hour that is served throughout the whole restaurant. The Waffle Window – Any of their sweet treats are great, even though I do love their savory waffles as well. The American Local – With a blend of beef, brisket and short rib, this burger is not lacking for flavor. Bamboo Sushi – It’s a huge burger with tons of great topping. Be prepared to share, it’s huge. Urban Farmer – It’s the housemade English Muffin that seals the deal on this one. Word of Mouth is my favorite for breakfast & lunch! The veggie hash & spinach salad is WONDERFUL! Always worth the wait.